Oh sweet baby goodness. If I could share these through the screen, I would! Bite, bite, bite. All it takes is 3 bits to polish one of these babies off. Maybe 2 bites. These cookie dough bites are eggless, they can be made gluten-free (subbing 1-1 with GF flour blend), and dairy-free if you use a dairy-free margarine. I’m all about the versatile and these are versatile and easy to adapt to fit any food allergy profile! And I say overdose, because I dare you to eat just one. Or just 4. You’ll likely end up eating 5 or 6. And that’s ok, you won’t be alone if you do. I did it too. We’ll stand united in our lack of self control when it comes to cookie dough bites. Chances are you have everything you need on hand. Except maybe the mini chocolate chips and the candy coating. You’ll want to add those to your shopping list asap. Beat together the butter and sugars until smooth. Add in the milk and flour and beat until smooth. Stir in the flour and salt until dough forms and gently stir in the mini chocolate chips. 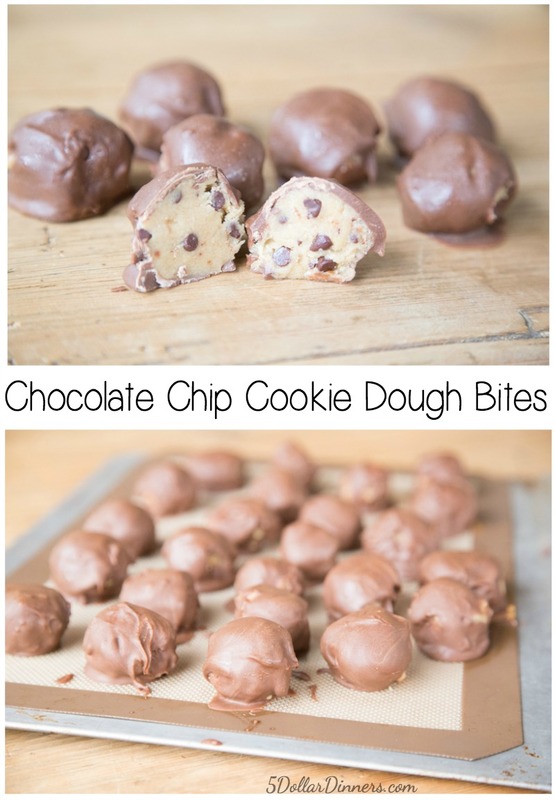 Form dough into about 3 dozen 1″ size cookie dough balls. Chill for at least 30 minutes. After the dough has been chilling for awhile, melt the chocolate candy coating in a double boiler or microwave, as directed. Take the chilled cookie dough balls and dip them in the melted chocolate, spinning it carefully to cover the cookie dough. Once coated in the chocolate, place on parchment or wax paper lined cookie sheet. Chill for at least an hour and keep chilled until all eaten. Wow! That looks AWESOME! !I don’t have mini chocolate chips, or chocolate candy coating, but I’m sooooo tempted to try it with “regular” chocolate chips. Size doesn’t, or shouldn’t, matter if it never makes it into balls and gets eaten straight from the bowl, right? We made these tonight and they bombed. Not sure what we did wrong..followed the recipe exactly. I wonder if you can use store-bought dough and almond bark?? I use regular chocolate chips melted, and it worked fine. I bet almond bark would work well.